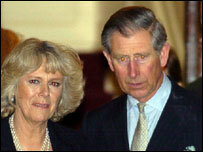 The church blessing of the Prince of Wales' marriage to Camilla Parker Bowles will be televised live. The 45-minute religious service will follow the private civil ceremony at Windsor Guildhall on 8 April. Led by the Archbishop of Canterbury, the blessing in St George's Chapel at Windsor Castle will be attended by about 750 guests. The Clarence House move ends debate over whether the public will see the couple on their wedding day. Previously, it was suggested that the media would be barred from the civil ceremony. A Clarence House spokesman said "all parties have agreed that televising the service in St George's is the right way forward". He said the Queen, the Prince of Wales, Mrs Parker Bowles, the Archbishop of Canterbury and the Dean of Windsor were all consulted about the decision to televise the ceremony, which will be on the BBC. In 1981 some 750 million people watched Prince Charles marry Lady Diana Spencer at St Paul's Cathedral. While the April blessing will also be broadcast to the masses, only 30 people will be present at the Guildhall to witness the marriage in person. The Queen and the Duke of Edinburgh have already announced they will not be attending the civil ceremony, but will be at the church blessing. There has been interest in whether Charles and Camilla would decide to include prayers of penitence in their blessing. If they do, the nation could see Charles and Camilla, who committed adultery together, confess their sins in a standard prayer.